A Golf Poem by Herbert Warren Wind! After the U.S. Open Championship ends as it did so dramatically last Sunday, you might look forward to what the pundits on the Golf Channel or in the newspapers, golf magazines and blogs have to say. Years ago, if you followed golf faithfully, you waited patiently for Herbert Warren Wind’s New Yorker article. And you were never disappointed. Wind, who graduated from Yale University, and earned a Master’s degree in English Literature from the University of Cambridge, began writing for the New Yorker in 1941. He covered the major golf tournaments for the magazine from 1960 to 1990 when he retired, a period when television coverage was for the most part still limited. With Wind’s retirement golf writing took a hit from which it may never recover. As far as I knew, Wind confined himself to prose, so I was surprised to learn (from Bill Scheft, a Wind nephew) that Wind’s first contribution to the New Yorker was a poem. With Scheft’s help I found the poem on the last page of Herbert Warren Wind’s Golf Book. I offer it more as an historical artifact than great poetry. Wind’s prose will more than suffice. By tens should speed require. 1-1/10, 2-1/10, 3-1/10, and so on. He does it in his bean. 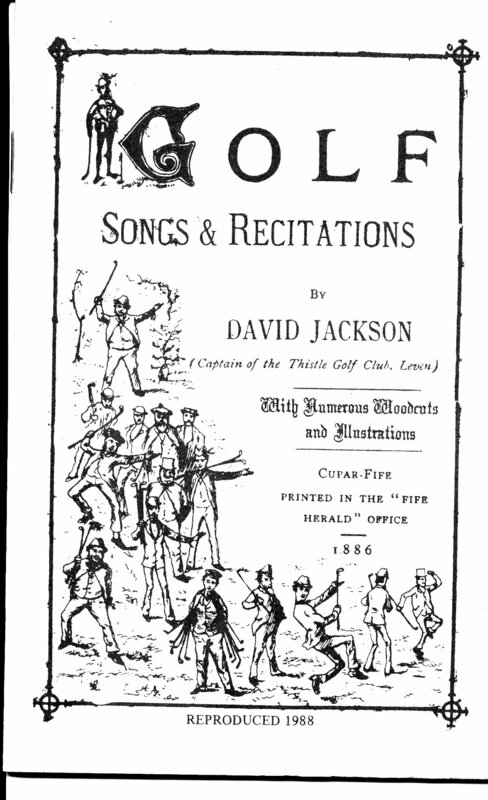 In 1886 David Jackson, the Captain of the Thistle Golf Club in Scotland, published a 32 page tract of poems and songs at the “repeated request of many members of my own and other Clubs.” Earlier in 1833, George Fullerton Carnegie privately published a long poem called “The Golfiad” which he dedicated the “Members of all Golfing Clubs, and to those of St. Andrews and North Berwick in particular.” They were his readers. In the first 30 years or so of the 20th century, the audience for golf poetry expanded. The poetry appeared in golf magazines in both the United Kingdom and the United States and in a few newspapers as well. A number of (real) books of golf poetry were also published But after about 1930, golf poetry lost its place as a part of the literature of golf and all but disappeared. As Grantland Rice saw it, “…good poets suddenly disappeared and readers for some reason lost the old poetic zest.” It may also be that movies, radio and other sources of entertainment began to attract audiences away from poetry in general. Today poets struggles to attract an audience and golf poetry has few serious adherents. But we can, with the help of the internet, libraries and the digital reprinting of out-of-print books, rediscover the golf poetry of the past, which is what I have attempted to do with this Blog and my book Golf Course of Rhymes – Links between Golf and Poetry Through the Ages. And happily a number of readers have responded. With the help of WordPress.com, my Blog host, I can tell you that golf poetry today enjoys a wider audience than ever before. Poetry on this Blog has been read (and hopefully enjoyed) by readers in more than 70 countries. Leading the list are the countries most associated with golf’s history, the United States (54% of the page views), the United Kingdom (21%), Canada (6%) and Australia (3.3%). But all of the continents have contributed viewers and the Blog has even had four page views from Iceland and two from Belarus! Page views in total for the three plus years of this Blog have passed 67,000. And sometimes poetry dings prose.